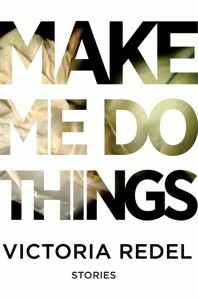 Victoria Redel has been awarded the 2014 Devil’s Kitchen Reading Award in Prose for Make Me Do Things. In eleven original, surprising and deliciously dark stories, award-winning author Victoria Redel moves effortlessly between men’s and women’s perspectives as they explore marriage, divorce and parenthood. A newly divorced mother stumbles her way back into single life. A young man and his girlfriend clean out his dead mother’s overstuffed home. A woman struggles to hide her affair from a doting husband and inquisitive daughter. A man descends into a drug-fueled dream as he imagines losing his pregnant wife to a historical, nineteenth century figure. This is the story of the year my wife became the sea captain’s wife and carried his child, a child that is by all rights mine. My wife is wildly, crazily, ridiculously, fucked-uppedly beautiful. It’s insane but she’s almost more beautiful in the bonnet and linen-spun gown she walks through town wearing on her way to and from the Captain’s house. I can’t imagine how this must sound. If you’re married, I’m counting on you having at least come to the minor revelation of how little we know inside another marriage. And maybe, wherever you are in your own marriage–crossing a rainy parking lot on your way to the office or coming at night to your front door–with a sharp, embarrassed flash or a longing you can’t quite name, you’ve wondered what you really know about the house you’re about to enter, about your own marriage? "It’s impossible to nail down Redel’s style. Each of these eleven stories is uniquely crafted, perhaps because she approaches them with a protean lens, focusing attention down on the particular details of narrative and syntax, so that the result is clarity of intention and meaning. As a writer, she is willing to let her images guide her, willing to follow her sentences and characters into whatever strange and twisted paths they seem destined to trod." Read the full review. 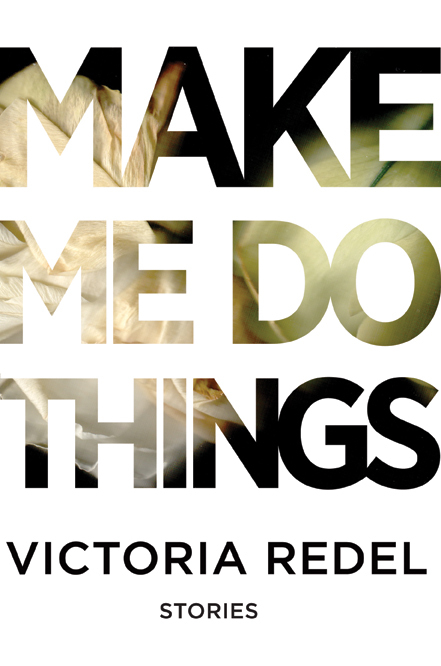 "The eleven stories in Make Me Do Things all embody Redel’s ‘singular kind of voice,’ one I’d call fearless, sometimes brash, but compassionate, too. Like two other contemporary masters of the short story, Antonya Nelson and Amy Bloom, Redel has a gift for dialogue and for recreating the distinct rhythms of individual lives.” Read the full review.